This fall I will be taking part in an interdisciplinary faculty seminar on racial and ethnic justice and the common good, contributing to the Jesuit, Catholic vocation at Santa Clara University as a transformative social force. 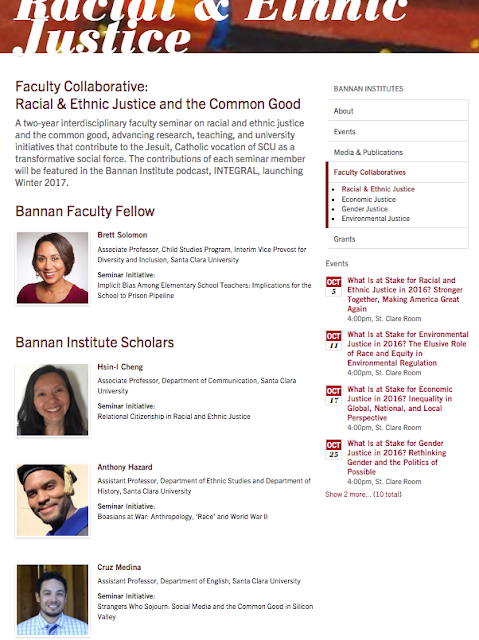 In addition to contributing to the seminar with my own talk on January 23, 2017, I will also be taking part in a Bannan Institute podcast--Integral--which launches in Winter 2017. Below is a snapshot from the SCU website, which can be seen here. Our first event will be the panel discussion "What is at Stake for Racial and Ethnic Justice in 2016? Stronger Together, Making America Great Again," where Brett Solomon, Anthony Hazard, William O'Neil, and I will discuss the implications of the coming election with regard to the topic of racial justice, within the context of our academic disciplines.